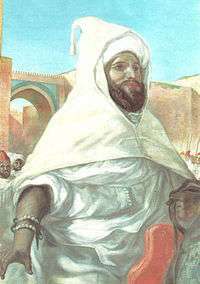 Moulay Abd al-Rahman ibn Hisham (Marrakesh, 1778 – Meknes, 28 August 1859) (Arabic: عبد الرحمان‎‎) was the sultan of Morocco from 1822 to 1859. 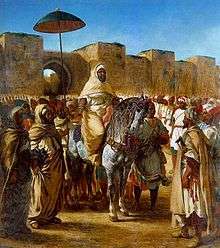 He was a member of the Alaouite dynasty. He was an adept leader and administrator and was able to build public works and infrastructure. He did however have to deal with internal conflicts and had to quell revolts many times: 1824, 1828, 1831, 1843, 1849, and 1853. He was always successful at placating the nobles and malcontents though. 1 2 3 4 5 6 7 8 "'Abd ar-Rasham". Encyclopedia Britannica. I: A-Ak - Bayes (15th ed.). Chicago, IL: Encyclopedia Britannica, Inc. 2010. p. 17. ISBN 978-1-59339-837-8.